Stewardship: Wetland Stewardship is all actions or plans that are directed towards protecting the natural features and processes of a wetland. Just a decade ago, Las Lagunas was overgrown with scrub and brambles, and barbed wire. It had become the local dump and her marsh waters were overgrown with cattails. In 2009, a team led by Arlyn Johnson of the Santa Fe Ranch Foundation began two years of technical expertise planning meetings facilitated by the National Park Service. During these two years a dedicated team from the community met with scientists, hydrologist, biologists, environmentalists, birders, and more. We developed a mission statement and a plan of action. and taught them principals of stewardship and conservation. 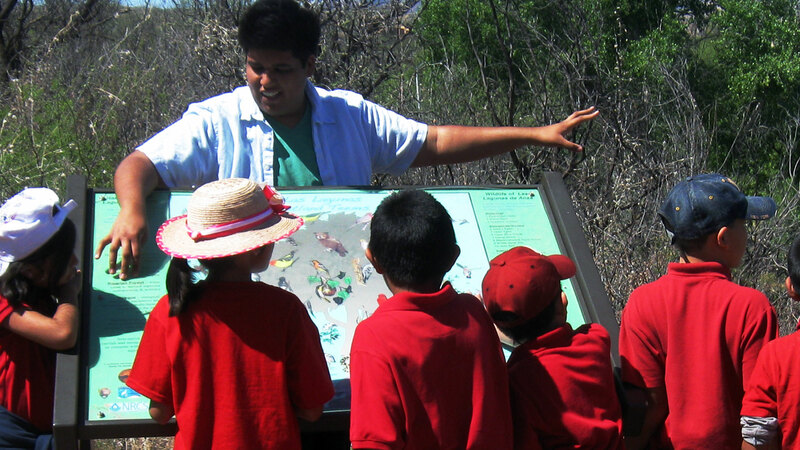 We now have over 1000 students visiting the wetlands every year and through their experiences here; hiking, observing, recording, discovering and enjoying the marsh… they learn about the wonders of water in the desert and the plants, animals, birds and insects that thrive in her various habitats. They understand this precious resource and return home to tell the stories to their families and friends. We invite you to be a part of the conservation and stewardship of this unique and wonderful site by visiting, volunteering, donating your time or money to help keep it going for our young children.